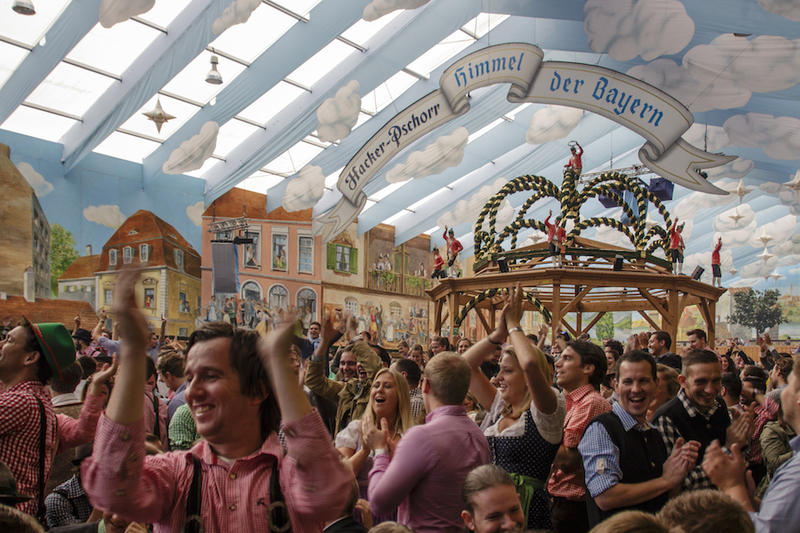 Dirndls, lederhosens, steins, pork knuckles, Robbie Williams' 'Angels' and dancing on chairs...Welcome to Oktoberfest, the happiest place on earth. It is very likely that this will not be your only trip to Oktoberfest so don't stress if you cannot visit all the beerhalls in the time that you are there, unless you do what I did and stay for the entire duration of the event...what can I say, I like German beer. There are over 12 different beerhalls and I still didn't get a chance to see them all. Dependent on the day (midweek or weekend) will determine what time you will need to stay inside the beerhall to avoid getting locked out, so this will have an affect on you being able to walk in to other tents to check out the decor and atmosphere. Weekends are always the busiest, and most beerhalls close their doors between 1:00pm - 3:00pm, so make sure you pick one and get in early to get a table! I have seen first hand the consequences of breaking these rules, and to put it simply: you get removed from the beerhall. These rules are in place to keep everyone safe and to make sure you have a great time, which of course you do! 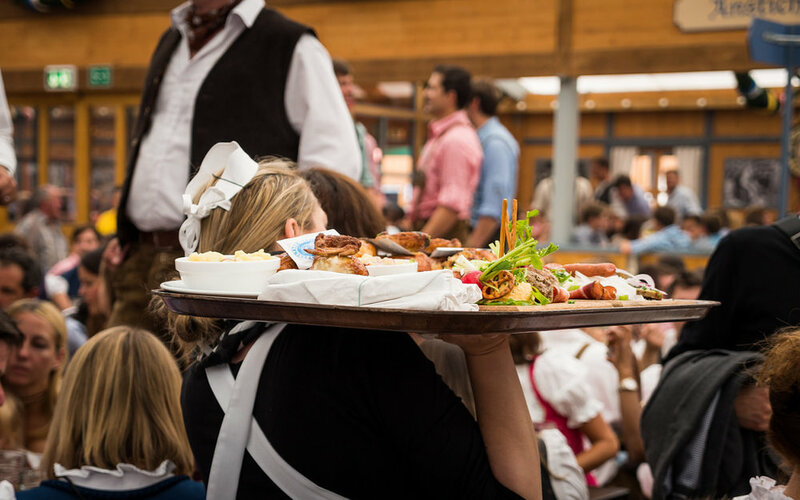 Don't feel like you need to enrol in an 8 week German language course just to be at Oktoberfest, however it is nice to have a few words under your lederhosen or dirndl ready to pull out when ordering a beer. 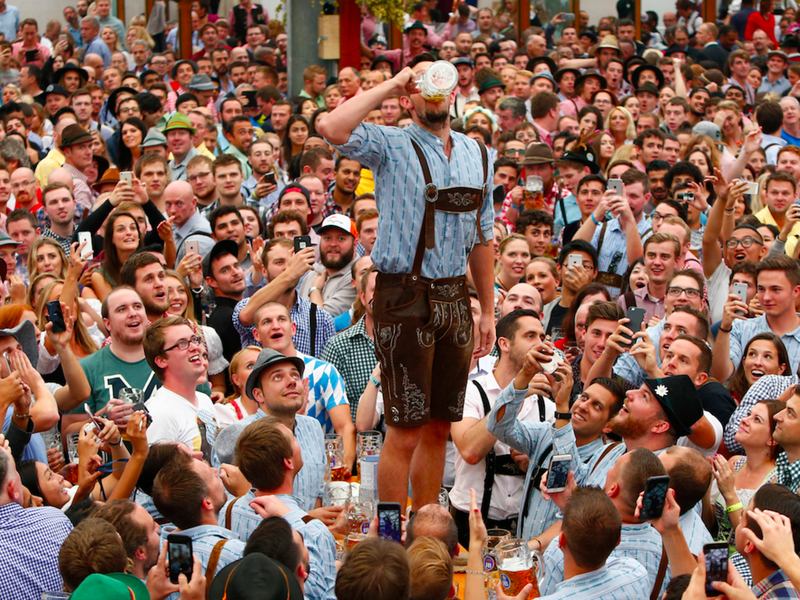 It helps you to feel like you are really involved in the experience, traditions and customs of Oktoberfest. Steins have been increasing in price by approximately 25c (Euro) each year and in 2017 they were priced at 10.90 EUR per stein. As the price does increase it is important to remember to tip your waiters/waitresses (kellner/kellnerin). It is amazing how they can carry so many steins at one time, and you might not believe it but they do not get paid to work at Oktoberfest, their tips are their wage. A little secret, the better you tip the more you will get looked after during your time in the beerhalls, hello first service! Something I do when purchasing a new beer is give the first sip to the waiter/waitress. Why? They do very long shifts in the beerhalls carrying beers for everyone but themselves, it's a nice gesture and they really appreciate it. Something to remember if a waiter/waitress has a beer in their hand, they will ‘prost’ with everyone on the table so don't leave them hanging! 5. DON'T FORGET THE RIDES! Oktoberfest is first and foremost about the beer but coming in a close second are the rides. Oktoberfest is a showground of rollercoasters, dodgem cars and ridiculously high spinning swings, but my favourite of all is the Fun House (shown in the photo above). If you were thinking of fitting in all the rides make sure you go in the morning (weekends are of course a lot harder to get back to the beerhalls). For the fun house you do need to have a few steins under your belt, and it is better visiting it at night with the bright lights...make sure you wear the glasses they give you - it makes the experience that much better! Disclaimer: Do not go on the fun house if you have a pre-existing injury, you will most likely hurt yourself in the same spot like I did. But I know how excited you can get after a few Bavarian steins! There are many local dishes available in the beerhalls and it is worth trying as many as possible however you cannot go past a succulent pork knuckle. Every beerhall will have a slightly different menu, but each one I have been in does have this mouth-watering traditional Bavarian dish. it’s always good to order on an empty stomach as they are massive, I normally have to share one with a friend. And don't forget the potato dumpling! Every beerhall has a band that begins playing around midday-sometimes earlier if we are lucky-and they always play a mixture of well-known sing-alongs and German/Bavarian songs. To fit in with the crowd, it is well worth researching some of the traditional songs so you can sing along with your new German friends. My favourite is Fliegerlied. It has some amazing actions, so make sure to YouTube it! I hope to see you all next year in Munich. 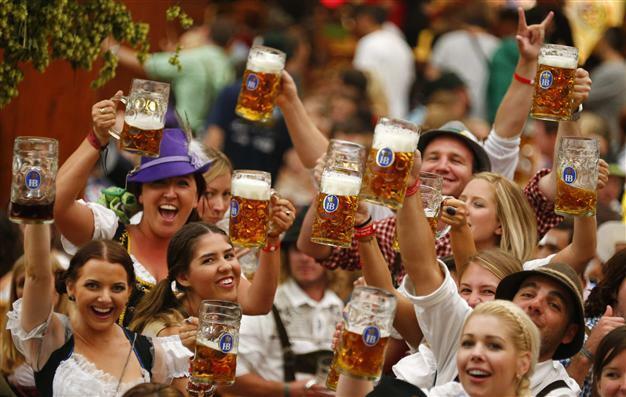 Make sure to save a spot on your chair for a dance and a chance to prost a few steins! Newer PostThe Most Popular Places on Trafari!